Click on any shirt to see enlarged versions of the front and back designs (coming soon). Carbon colored shirt with a small Cardon printed on the front and a large Cardon on the back. Navy colored shirt with the peninsula printed on the front center and two humpback whales on the back. Black shirt with pink print of Catrina. Small on front and large on the back. Navy shirt with mom and baby grey whale on the front and small sun on the back. 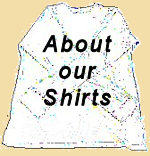 If you like our t-shirts then you might also be interested in our line of fine 100% natural handmade soaps, lotions and lip balms. Click the soap icon to visit Desert Soaps and see our individual items and our gift packs.